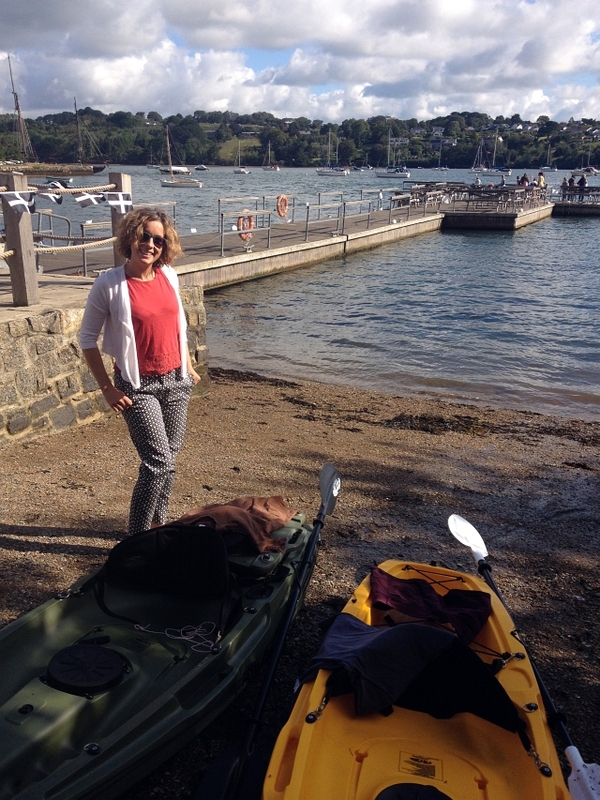 On one of the final days of my summer holiday, we decided to kayak to the popular Pandora Inn on the edge of Restronguet Creek. With its flagstone floors, low-beamed ceilings and thatched roof, dating back to the 13th Century, the Pandora truly is a landmark. 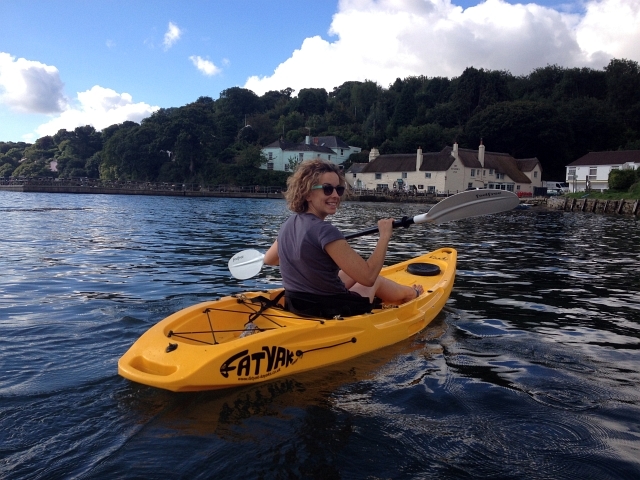 As they have their own mooring at the front of the pub, the Pandora Inn is accessible by the water and I couldn’t think of a better way to travel there than by kayak. So setting off bright and early, we made our way from Loe beach approximately a two mile paddle away. 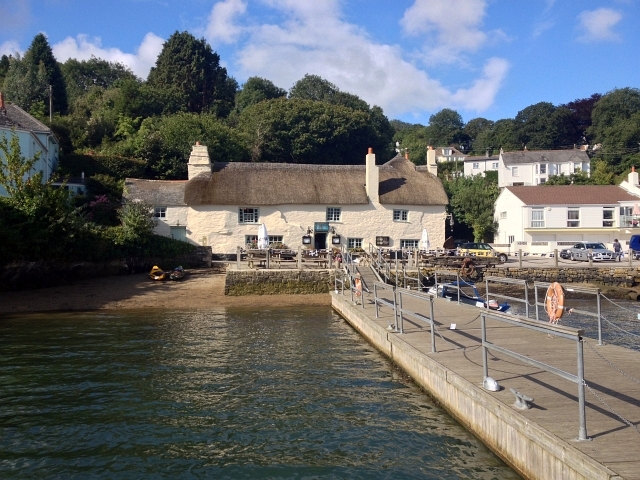 We wanted to get to the Inn at high tide, so that it would look its best. Because of this we had had to leave early. With the Pandora opening at 10:30 to serve tea and cakes, we had left Loe beach just after 9, this would give us loads of time to paddle up Restronguet Creek and explore the local area. After landing the two Fatyak Kaafu at the Pandora Inn we opened up the Kaddy Storage Pod and got out our nice dry clothes. A quick change under a robie and we were good to go. We sat on their pontoon with awesome views across the river and back towards the inn. 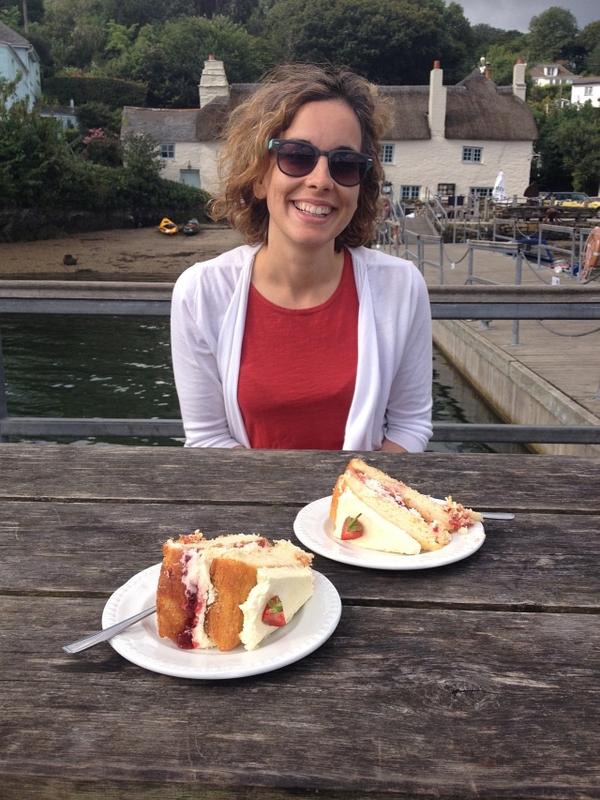 Tucking into a massive piece of cake and sipping on a lovely cup of tea was a great little treat and reward for getting up and paddling early in the morning! 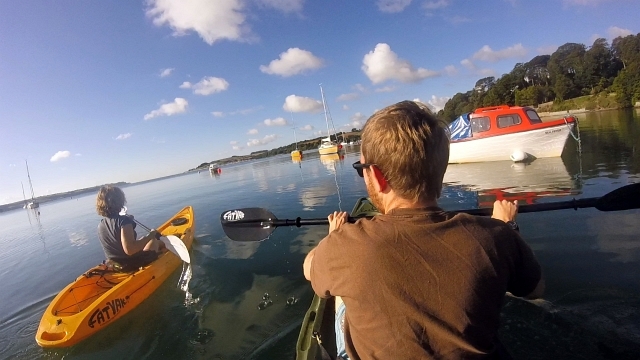 As lovely as it was though, we didn’t want to spend the whole day munching so we launched the kayaks and got back on the water, deciding to go back past Loe Beach and paddle up the Fal towards Truro to explore some more. 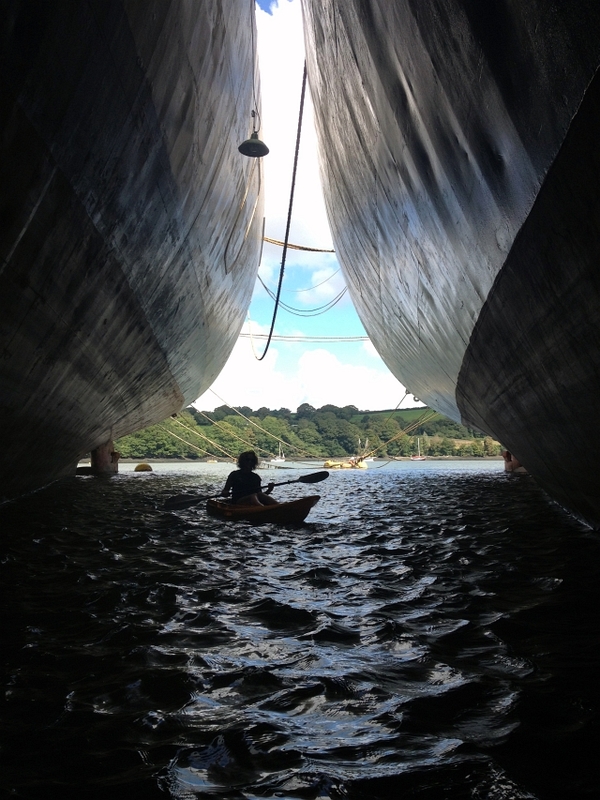 After paddling past The National Trust’s Trelissick Gardens and the King Harry Ferry, we were met by the staggering sight of two huge, fruit transporting cargo ships. As we paddled closer, they appeared even taller and more vast. 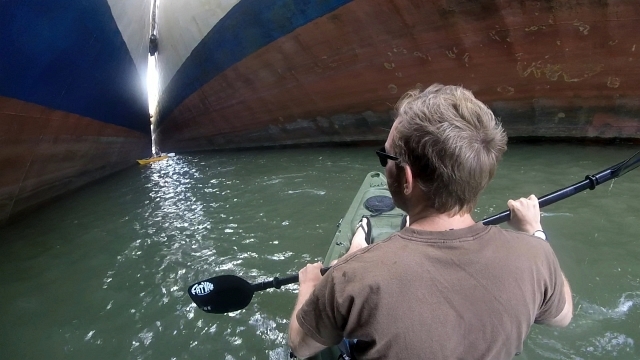 In fact the ship was so big that you could actually paddle above the propeller in between the rudder and the hull. 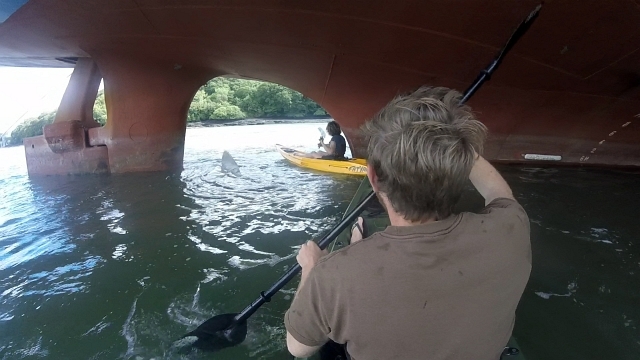 We wanted to paddle down and between the two ships (which was probably a pretty stupid thing to do) but fortunately we were not able to as they were so close they almost touched and you couldn’t even fit a kayak between them. I loved how the boat curved out above your head so that in between them was completely shaded from the sun and all around you was just thick metal hull. 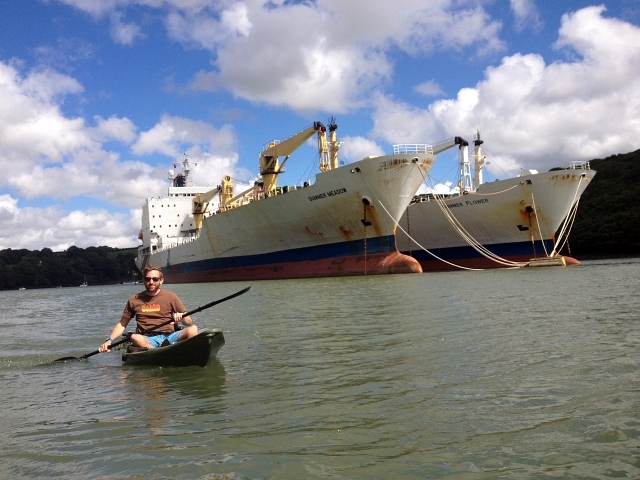 These ships look pretty impressive from a distance but up close they really are epic! 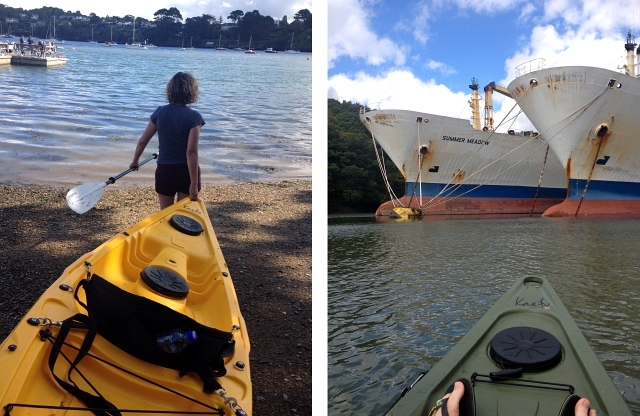 After an awesome paddle we made our way back with the flow of the river and tide, to Loe Beach and back home!